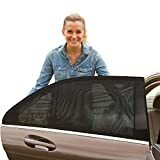 ShadeSox Universal Fit Car Side Window Baby Sun Shade | Protects Your Baby and Older Kids from the Sun, Fits All (99%) Cars! Most SUVs! (2 Piece) | Travel eBook Included! / ShadeSox Universal Fit Car Side Window Baby Sun Shade | Protects Your Baby and Older Kids from the Sun, Fits All (99%) Cars! Most SUVs! (2 Piece) | Travel eBook Included! As a parent, your number one job is to care for your children. ShadeSox sun shades do just that! Do your kids complain about too much sun, heat, and glare in the back seat? Do you worry about your baby getting too much sun back there in the car seat, where you can’t reach your child unless you pull over? Have you ever seen another driver tooling along in a car whose side windows were deeply tinted… and felt a pang of envy? Did you wish your car, too, could enjoy the enhanced protection, the privacy and, the greatly reduced interior temperatures that window tinting can provide? Does your stomach churn a little at the thought of applying those cheap, tacky, bubble-pocked stick-on window tints to your automobile? ShadeSox can solve all these problems… The ShadeSox side window shade is made of a flexible, stretchy mesh material (40D Nylon) that helps block the sun, making your child safer and your car cooler. ShadeSox won’t hurt your car’s paint job or its interior, either. This durable. lightweight fabric simply pulls down over the car door. Installation could not be simpler! Close the door to secure the shade, which is so thin and light that you’ll never know it’s there. Once it’s on your children will be protected, and you’ll enjoy much cooler in-cabin temperatures, greater privacy, and a clean, classy look. And the best part is, when summer’s heat fades, the shades can come off in less time than it takes to read this. Each set contains shades for two side door windows, Don’t wait; get your sunshade set today. 100% money back guarantee! The sun shade is a superior product with many benefits, including: – Covers entire window for 100% protection against sunburns. – Prevents damage and marks on car door glasses! – Improves air flow within the car! INCREDIBLY EASY TO INSTALL! The flexible, stretchy mesh just pulls down over the open car door. Fits almost every car to a maximum of 44.3 inches by 20 inches. YOU CAN STILL ROLL DOWN THE WINDOWS! The mesh is breathable, and because it’s on the exterior of the door frame, you can still roll down the windows and enjoy a nice breeze from outside while staying protected from the sun. Stick on tinting can’t do that! SATISFACTION GUARANTEE!! Each sunshade is well made, durable, and easy to use. Buy a set today before it gets any hotter out there! BONUS GIFT: an eBook featuring 10 creative ideas for keeping children occupied in the backseat while traveling.